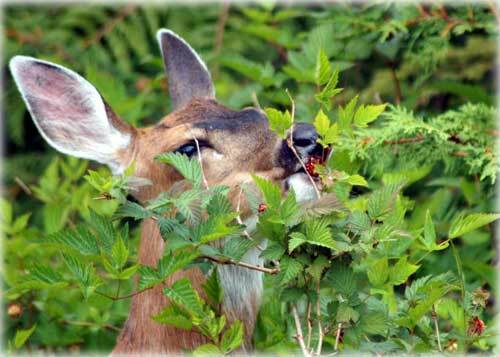 A Sitka Black-tailed deer enjoys the 'fruit' of the Salmonberry. According to Wikipedia, the name Salmonberry came about because of the First Nations' fondness for eating the berries with half-dried salmon roe. Fish Factor: "No" to self-tax to fund Rainforest Wild By LAINE WELCH - Salmon fishermen in Southeast Alaska again voted "no" to bankrolling their own Regional Seafood Development Association, already widely known as Rainforest Wild. RSDA's - a unique concept ok'd by the state in 2004 - lets fishermen in 12 Alaska regions band together and tax themselves based on the value of their catches. The tax is collected by the Alaska Dept. of Revenue and the money is disbursed back to the RSDA each year. It can be used for marketing, infrastructure, ice barges, new products - whatever the fishermen want. RSDAs also give fishermen more access to federal and state grants and programs. Ballots were sent in May to 475 Southeast drift gillnet permit holders asking if they approved a one percent self-tax to fund the association. The state released the results last week -- of 212 votes, 60% voted no (132/80). Two years ago, a similar RSDA effort lost by two votes. "I guess the majority just don't want it. I'm surprised it lost by such a wide margin," said a disappointed John Jensen of Petersburg, an interim RSDA board member working to get the RSDA off the ground. "It is too bad that these guys don't realize they need to think beyond Southeast Alaska, and that they are competing with a much wider market," said Richard Mullins, marketing manager at Orca Bay Seafoods. "They used to think they were competing with other areas of Alaska, now they are competing town by town. Their competition is more than Alaska, and even more than Atlantic salmon - it is center of the plate proteins!" Part of the difficulty stems from the vastness of the fishing region, said interim program director Elizabeth Dubovsky. "The geographic expanse of Southeast Alaska is one of the things that make it such a unique region. It's a blessing in some ways, and in other ways it's a challenge," she said. "Especially when you're trying to bring all these fishermen together under one group, and then you bring money into the picture, and that makes it even more challenging." "I know from talking with people that there's a lot of apprehension that one community would get more of the money than others, and wouldn't be treated fairly. For example, Petersburg has the largest gillnet fleet, and I think people were worried about that," he explained. Ketchikan: Ketchikan joins cities nationwide for America's Night Out Against Crime - On Tuesday, August 4, 2009, neighborhoods throughout Ketchikan are being invited to join forces with thousands of communities nationwide for the "26th Annual National Night Out" (NNO) crime and drug prevention event. National Night Out, which is sponsored by the National Association of Town Watch (NATW) and co-sponsored locally by the Ketchikan Police Department and Tongass Substance Screening, will involve over 15,000 communities from all 50 states, U. S. territories, Canadian cities and military bases around the world. In all, over 37 million people are expected to participate in 'America's Night out Against Crime'. NNO 2009 is being supported in part by TARGET, the national corporate sponsor. Science - Technology: Windspire' turbine could be breakthrough in wind power By JOHN MURAWSKI - It looks like an abstract sculpture or metallic lawn art, and its promoters say that installing several can turn an ordinary backyard into a wind garden. Some Green energy advocates say the Windspire, a power turbine that spins in an upright position in a confined space, could represent a major breakthrough for wind energy. Instead of using towers 100 feet tall or higher for conventional windmills, the Windspire is just 30 feet tall. Science - Technology: Technology from NASA space program continues to touch everyday life By DAN MAJORS - You don't have to look to the stars to see how America's space program has touched your daily life. Look at your cell phone, your tennis shoes, your tool belt, your computer or television. Daniel Lockney, editor of Spinoff, a NASA publication since 1976, makes it his job to inform readers of the benefits of space technology, from medicine to industry to entertainment. DAVE KIFFER: Ketchikan Didn't Need to Be 30 Miles Long, Four Blocks Wide - I have the greatest respect for the founders of Ketchikan. They came up here, survived the weather that we only grumble about in much worse conditions than we have to deal with - outdoor plumbing and no central heat, anyone? They chopped and they dug and they blasted and they built a town - Our Fair Salmon City - that clings to the side of a hill. And when that wasn't enough they filled and built pilings and managed to make a bigger town out of just about no flat land at all. In fact, they created our lovely little "30 miles long, four blocks wide" community. And we are here because of them. God bless them. But sometimes I can't help but wonder, out of all this wilderness, couldn't they have chosen a slightly better location? No, I don't mean Cabo San Lucas or Waikiki - although October would be much more pleasant in both those climes. MARTIN SCHRAM: Pay vets' disability claims -- now - Today we are proposing a solution for stimulating America's slow-to-recover economy that can please Washington's left, center and right. And it has the added virtue of patriotically doing what is right for those who have already done so much for us all. The U.S. economy has responded more slowly than many predicted to the Obama stimulus plan. Unemployment has soared to a 25-year high. For months we heard about stimulus projects that were "shovel-ready." Now we know what the politicians were shoveling. Today many experts say a second round of stimulus will be needed. Yet Republicans who opposed the first stimulus as too costly and too porky still prefer to do it with tax cuts. Perhaps we can do the job without more shovels or more tax cuts. JAY AMBROSE: Health care? Nope, land shark - Someone's knocking at the door, the young woman inside the apartment asks who's there, and a pleasant voice replies, "flowers." The woman is suspicious, and is then told "plumber," and later "candy-gram." It's really a shark -- a land shark that hangs out in urban areas, or at least in the old "Saturday Night Live" skits -- and it finally tricks the woman into thinking it's a dolphin. She opens the door and is devoured. This was all very, very funny when the movie "Jaws" was a hot topic, but what's not so funny is the congressional version we've lately been seeing in Washington.